Do you need security for your home or business in Fort Saskatchewan? Is your security system in need of an upgrade, or is it time to install a new one? Are you having loss prevention issues at your business, or do you need help with screening or crisis management? At Optimum Security, we are ready to provide the security solutions you need in Fort Saskatchewan. Our well-trained officers work side by side local law enforcement to make sure you are well-protected in both your home and your business. Do you need on-site security guards to create a visible deterrence in a public venue or to monitor surveillance? At Optimum Security, we provide security guards and other personnel who are meticulously trained and who hold to the highest standards of professionalism. 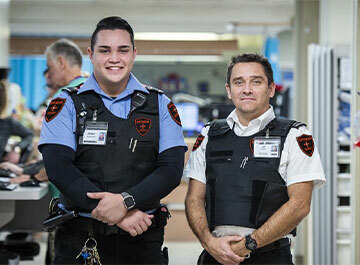 Uniformed security guards create a visible deterrence to inappropriate actions on the part of employees or visitors, and our guards can keep an eye out for crime, disorder and other illegal actions, both through in-person observation or by means of high-tech video camera surveillance and alarm systems. When you need security tech, we can provide security systems that provide hands-free, direct access to our monitoring team 24/7, and our mobile patrol services keep an eye on your home or business. We can also provide systems to detect and monitor home invasion, fire, water intrusion and damage, smoke damage, carbon monoxide levels, and extreme temperatures. We use high-quality tech to protect you. If you want one of the fastest-growing security companies in Fort Saskatchewan looking out for your best interests, give us a call at Optimum Security today to see what we can do to protect you.